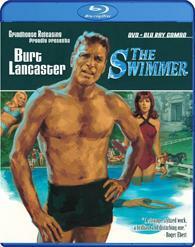 This much admired cult classic stars Burt Lancaster as Ned Merrill, who decides to swim across the country, using a chain of swimming pools in his friends' gardens. Along the way he meets a host of women from his past, faces humiliation, embarrassment and steamy encounters, before arriving home with a startling revelation. Studio bosses felt that the movie was too confused, and brought in director Sydney Pollack to tighten the narrative. 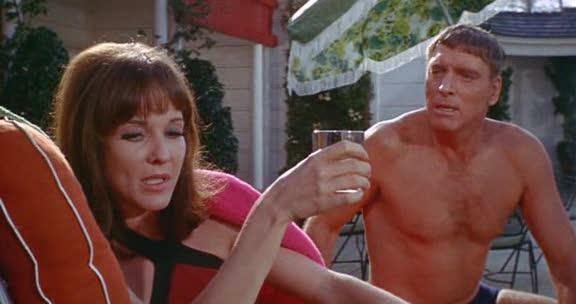 Based on John Cheever's short story of the same name, 'The Swimmer' stars Burt Lancaster as Ned Merrill, an ad executive and family man, who lives among the well-to-do in Connecticut. One sunny, autumn day, he decides to take an unconventional route home by swimming through different pools in the county, which he dubs the Lucinda River after his beloved wife. It makes for an usual journey to be sure, but it's the mental journey Ned takes that makes the film so compelling. During the opening sequence, the visuals show something is making its way through the woods as foliage is being brushed through and animals are scared off. The camera moves along at a quick pace and all of a sudden a man, who we later discover to be Ned, wearing nothing but swimming trunks comes into view. Ned approaches a pool, jumping right into it and starts swimming laps. The score by Marvin Hamlisch, his first in a long career that would see him earn an EGOT and a Pulitzer (a feat only matched by Richard Rodgers at this point), in these beginning scenes has moments that sound sad and ominous, hinting that things aren't as idyllic as they may seem. A cocktail for Ned appears in the frame. Friends Don and Helen are happy to see him, especially Helen who doesn't mind Ned kissing her feet in front of Don and Don doesn’t seem to mind either. They are hung over from a party and remark they haven't seen him a while. Ned figures he can make his way home through the county by way of people's backyards and swimming pools so he “can swim home.” Helen doesn't understand why he'd want to do that. At the next backyard, he encounters Howard and Betty. Ned talks about wanting his daughters to marry at his home, which causes strange looks from Howard and Betty at his wish. While previous clues that something is amiss are subtle, when Mrs. Hammer, the owner of the next pool Ned shows up, it becomes quite clear. Ned introduces himself as a friend of her son, a relationship she disputes since Ned never came to see or call her son while he was at the hospital. Ned runs away as she chastises him. As he gets closer to home, the people he encounters know him better than he even knows himself and reveal the story to the viewers. Lancaster gives one of the most impressive performances of his career as we see Ned's character slowly transform from the strong, virile, confident man at the beginning of the film. I can't remember the last time I saw a leading man of his type and era give such a vulnerable performance. What I enjoyed most about Eleanor Perry's screenplay is the story's ambiguity. This was my second time seeing the film and I am still not completely clear about what is happening with Ned. He seems like a man out of time, unaware of how old his daughters are or when he last saw people. His behavior and responses raise questions, but the viewer has to provide some of the answers because Ned is unreliable. 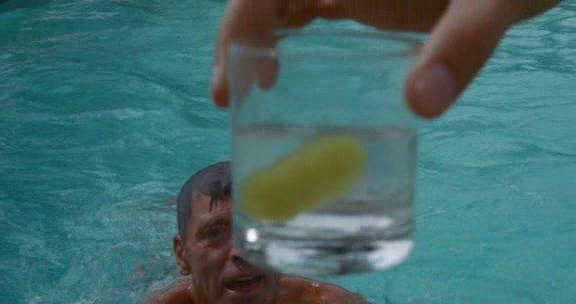 He tells a young boy, “If you make believe hard enough that something is true, then it is true for you.” What's true for me is that 'The Swimmer' is fascinating. Grindhouse Releasing presents 'The Swimmer' on a 50GB Region Region Free Blu-ray disc housed in a blue case alongside a DVD. The FBI piracy warning is given a clever, underwater effect, and then the disc boots up directly to the menu screen. There are trailers for 'An American Hippie in Israel', 'The Big Gundown', Corruption', 'Gone with the Pope', 'The Beyond', and 'Cannibal Holocaust'. The video has been given a 1080p/AVC-MPEG-4 encoded transfer displayed at 1.85:1 that looks impressive for its age. The source is quite clean, free from defect or age. Grain is light but apparent. The colors appear in strong hues, from the different shades of green foliage to the various outfits worn by the women, particularly at the Biswanger's party such as the bright pink shirt Joan wears. The accuracy of the red and white seen in the hot dog wagon is also a great indication of how well the colors have been rendered. Blacks are solid and as seen with Ned moving in and out of the shadows, the delineation is quite strong. Flesh tones are consistent, which is saying something since all Lancaster wears is a bathing suit. Close-ups reveal fine facial details. The lines and scars in Lancaster's face are clear, except one scene when the focus is soft as Ned talks to Julie Ann. Likely a source issue as other scenes find filters used to soften the focus. There was a slight bit of jitter in a slow-motion shot of Ned and Julie Ann swimming at the Bunkers. The audio is available in DTS-HD Master Audio Mono. The track sounds clean, free from signs age and wear. Dialogue is always understandable, though it suffers from the post production. The ADR causes the voices to sound flat and lifeless. Even worse, in a scene at the Bizwangers where there is in a slightly enclosed patio, an effect has been used to create echo that sounds completely unrealistic. Otherwise, the dialogue is balanced well with the other elements. Hamlisch's score best demonstrates the dynamic range. The bass is low and limited, heard mainly in the score and during the storm. The Story of 'The Swimmer' (D, 140 minutes) – This five-part documentary about the making of the film is very impressive. They speak with cast and crewmembers, such as 1st Assistant Director Michael Hertzberg, UCLA swim coach Bob Horn, actresses Janet Landgard and Joan Rivers, Marvin Hamlisch, as well as Lancaster's daughter, Joanna. It reveals what a troubled production it was, from director Frank Perry getting fired and reshoots being directed by Sydney Pollack to Barbara Loden being replaced by Janice Rule. Should be in the running for Best Feature of the year. Allison Anders Interviews Marge Champion – April 26, 2013 (HD, 18 minutes) – Shot at the 2013 Turner Classic Movies Film Festival, Anders introduced the film and then after the screening interviewed Champion, who had a small role in the beginning of the film,. She talks about working in the film and her career. John Cheever Reads the Swimmer (Audio only, 26 minutes) – The author reads his 1964 short story, but when is not stated. Trailers and TV Spots (HD, 5 minutes) – Presenting the U.S. Theatrical Trailer and five TV spots. Title Sequence Out-takes (HD, 4 minutes) – Set to Hamlisch's score is footage shot for the title sequence. Filmographies – Text filmographies of Frank Perry, Eleanor Perry, and Janet Landgard. 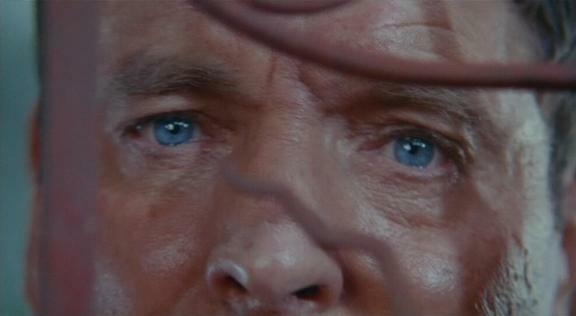 'The Swimmer' is a captivating character study about a man in crisis. Although there was great difficulty behind the scenes, it didn't detract from the final product. This was my first viewing of a Grindhouse Releasing title and they deserve great praise for this high-def marvelous presentation. This is highly recommended.